From new skates to hockey equipment, find everything you need at Kent Valley Ice Centre in Kent, Washington. Our Pro Shop carries a variety of items for hockey players and figure skaters, helping you get the equipment you need to stay competitive on the ice. If you are looking for something specific that you don't see on our shelves, please talk to a staff member. We are happy to help you order a specialty item or find something you like in a different size. Easily cut through the ice with professionally sharpened blades. 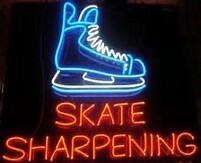 Our pro shop staff has more than 70 years of combined experience sharpening skates. We even have a few pro hockey players who understand the principles involved in quality sharpening. To keep our skills intact, we have our staff members sharpen our rental skates regularly, so they know exactly how to get the blades just right without damaging the integrity of the skate. Same day sharpening is only $10.59 and our overnight sharpening service is $7.73.